Two components were created in the Two-Step April clue. The one on the right with the hour-glass blocks resembles a holiday cracker. This mystery will probably have one or two more clues. I'm eager to see the quilt blocks these units will create. I see the cracker! You are really having fun with the surprise elements here! Red, white and blue is always a winning combination. Great colors of course - and I do see the cracker! 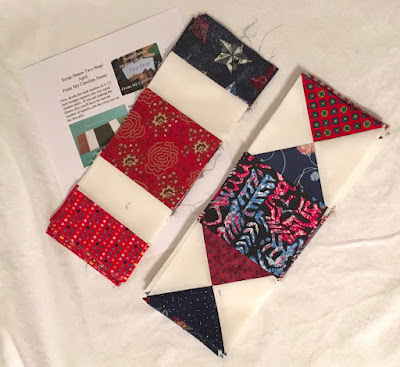 I love the red/white/blue quilts-this will be a winner! Very interesting! I can imagine two or three designs they might fit into. Not knowing where you are going is such an exciting way to assemble a quilt! You're right! I see the cracker! Very fun. Yes, they do look like crackers. I had a couple of "cracker" blocks in a Christmas quilt I finished last year. It will be fun to see how all these blocks come together.